Sekou Kompo from Guinea Conakry is teaching two regular weekly classes open to all from beginner to advanced. Sekou also offers school, college and univesity workshops as well as one-to-one tuition and teacm building conferences. 2 West African Dance workshops in One Afternoon! An afternoon of 2 dance workshops led by Aminata Kone and Afla Sackey. 4.30pm- 6.30pm. Traditional African dance workshop with Afla Sackey. This session will cover at least two rhythms and will introduce dunduns (ballet-style, village style and with variations), djembe patterns (with variations), solos and breaks. Yaye Dib Afrodance company presents a day of West African Sabar drumming and dance. 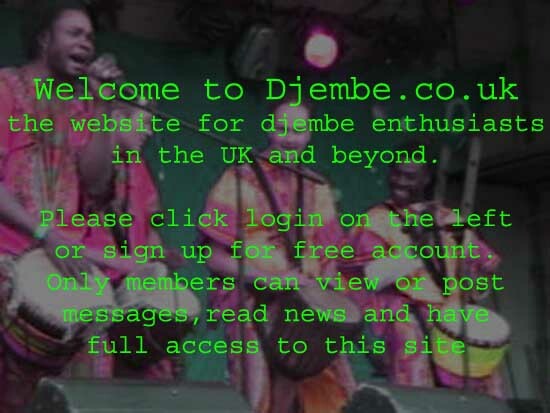 Djembe Drumming Circle - All levels welcome! Marcos Santana hosts Djembe drumming every Tuesday and Wednesday, here at The Rhythm Studio, based in NorthWest London. We are very close to Ladbroke Grove and Kensal Green undergrounds, the classes are great fun and will reinvigorate you after a hard day at work. They kick off at 7.15pm - 8.15 pm. Come and join us, and meet new friends.